Yasmin Ali: Founder. Community Leader. Connector. Yasmin Ali is first and foremost a generous community builder and connector who appreciates the power of education for improving the quality of life. She had a successful career in IT fully utilizing her Master’s in Computer Science well before she stepped away to be a full-time parent to her young children for over a decade–which is a fair amount of time in the course of a career. She never stopped working though; she simply worked full-time as a parent, an educator, and a community-builder; all with a common initiative to help people develop their full potential and create for themselves a meaningful life and career–doing work they wanted to be doing. Yasmin applied her energies for over a decade to homeschooling and raising children and leading the education committee of a diverse community organization she helped establish, the Muslim Association of the Puget Sound (MAPS). She worked with a diverse background of people in her volunteer position as the lead of the education committee for MAPS. She helped start an evening school which to date has served over 1000 students in the last ten years. While developing MAPS programs and curriculum, she came across people interested in working in the IT industry (in need of talent) who needed training first and access to jobs with career potential. And, she was clear that she wanted to give back to the under-privileged part of the society that had the intelligence and desire but not the access to training and connections. 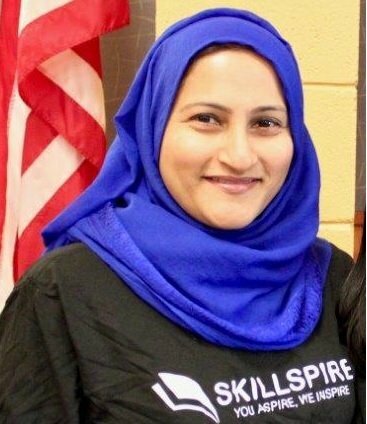 An entrepreneur and friend, Syed Hamid of Quantyzd, encouraged her to start Skillspire after he left Microsoft to start his venture because he encountered firsthand the need for motivated, skilled workers and saw how local talent could be tapped for this. Skillspire courses are created with the intention to offer rapid, relevant training and work placement solution to fill the talent gap in the IT industry in the Greater Seattle area with local, diverse, dedicated, and appreciative professionals. Skillspire aims to attract and train students keen to start their IT career that includes more women, minorities, low-income, and under-privileged talent who have the passion and mindset for excelling in an IT career.